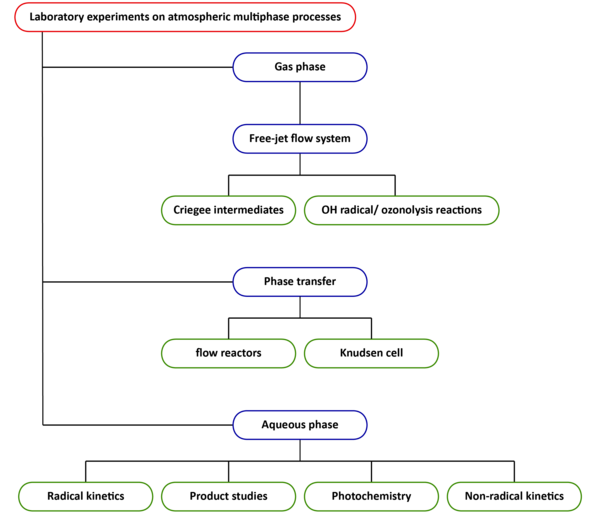 To improve the understanding of tropospheric multiphase processes, numerous laboratory experiments are available at the Atmospheric Chemistry Department (ACD) at TROPOS. Depending on the issue, processes are investigated that take place in the gas, aqueous or particle phase itself. Experiments conducted in flow systems enable the investigation of Criegee intermediates in the gas phase as well as mechanistic investigations on the product formation of OH radical reactions and ozonolysis reactions. Furthermore, there are laboratory setups for the investigation of phase transfer processes at the gas to liquid, solid or particle interphase or to describe the reactive uptake of certain species in the different phases. For this purpose, various flow reactors as well as a Knudsen cell are available at the institute. In the aqueous-phase laboratory (laserlab), the reaction kinetics provide information on the speed of radical reactions (e.g., OH, NO3 and SOx) and interactions with non-radical oxidants (such as ozone and hydrogen peroxide) in the pure aqueous phase. Furthermore, photochemical experiments are carried out by means of bulk reactors. In addition, a variety of analytical methods for the qualification and quantification of the reaction products are available (product studies).